'Cheeky' Gray has posted the It's Cheeky strip from Whoopee that introduced the Cheeky's Movie Masterpieces series. I agree with him that this was a superb series - the idea of spoofing a different film genre every week really reinvigorated the Cheeky pages and Frank McDiarmid did some cracking work during this period. Planet of the Japes is one of my favourites. The ninth week of IPC's 1979 Star Guest promotion saw Cheeky Weekly's resident middle eastern moneybags Mustapha Million embark on a promotional outing into the pages of Whizzer and Chips. This was the first time our prosperous pal had been pressed into Star Guest service (but it wouldn't be the last). In this story Mustapha meets Richie Moneybags (the scriptwriter would probably have liked to bestow upon the affluent Arab's rival the more alliterative monicker Richie Rich, but there was of course another comic character of that name, to whom Master Moneybags does bear a slight resemblance – well, insofar as his choice of neckwear, anyway). 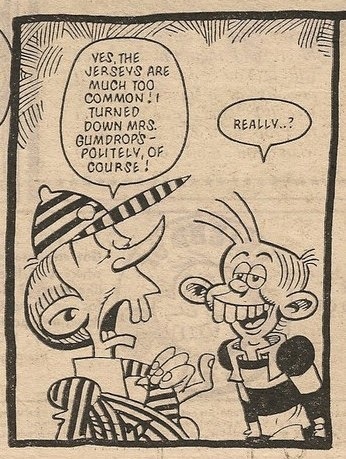 Richie also bears a striking resemblance to Boastful Bertie who Mustapha met in the 24 February 1979 comic. This Star Guest tale, which was new and never appeared in Cheeky Weekly, doesn't present Mustapha in the best light as his actions leave his competitor in tears. One might argue that the self-satisfied Richie deserved to be taken down a peg or two, but Mustapha himself regularly flaunted his wealth in a similar (although admittedly not as boastful) manner. 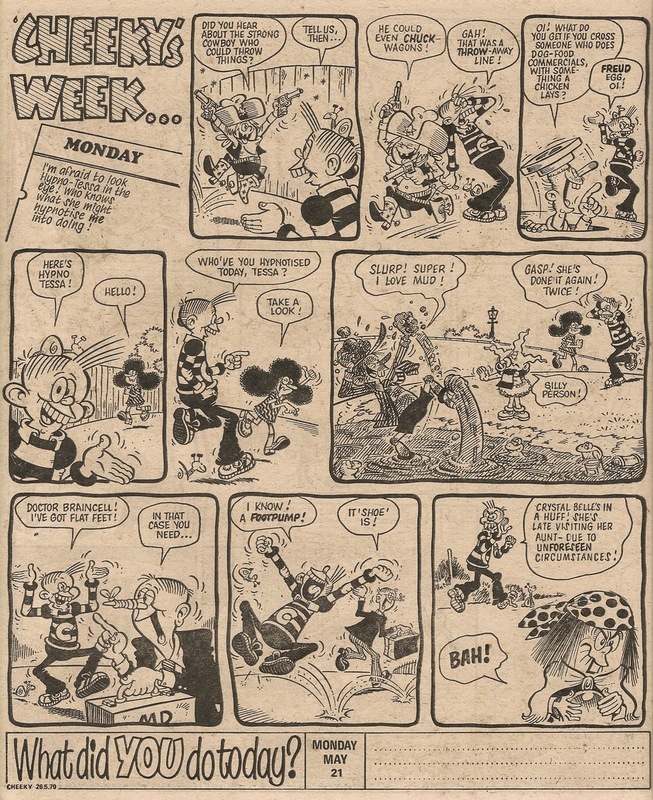 The page was drawn by Joe McCaffrey who had taken over as regular artist on the feature in Cheeky Weekly (replacing original artist Reg Parlett) as of February 1979. Mustapha enjoyed double-page adventures in his home comic, but was restricted to a single page in W&C to comply with the Star Guest format. 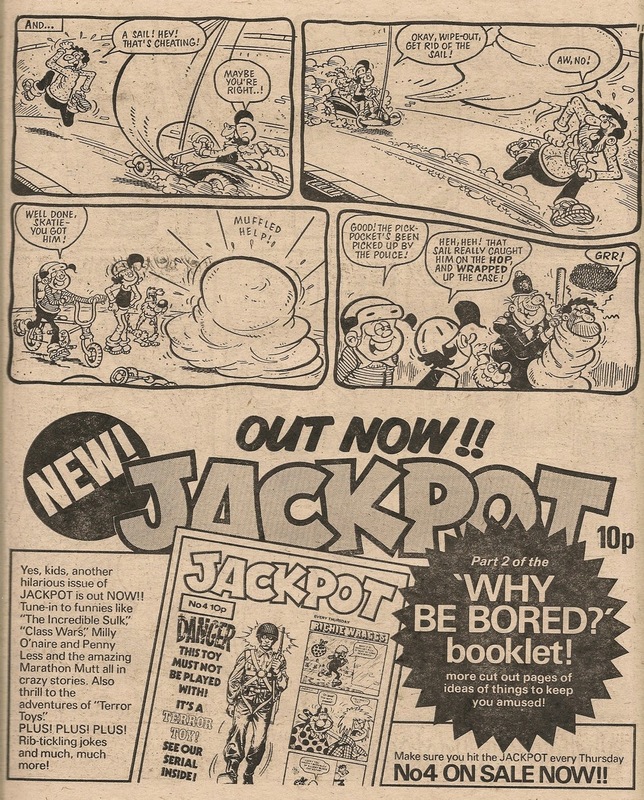 Unlike certain other of the Cheeky Weekly Star Guests in companion comics, Mustapha did appear in the contemporaneous issue of Cheeky Weekly so Whizz-Kids and Chip-ites who were sufficiently intrigued by his story to return to the newsagents' to pick up a copy of the toothy funster's title were able to enjoy a further two pages of their new chum's adventures that same week, and the loaded lad would be absent from just one issue before Cheeky Weekly came to and end. After the demise of our grinning pal's comic, Mustapha transferred into Whoopee and subsequently into Whizzer and Chips. Peter 'Cheeky' Gray has posted the It's Cheeky strip from the first combined issue of Whoopee! and Cheeky. 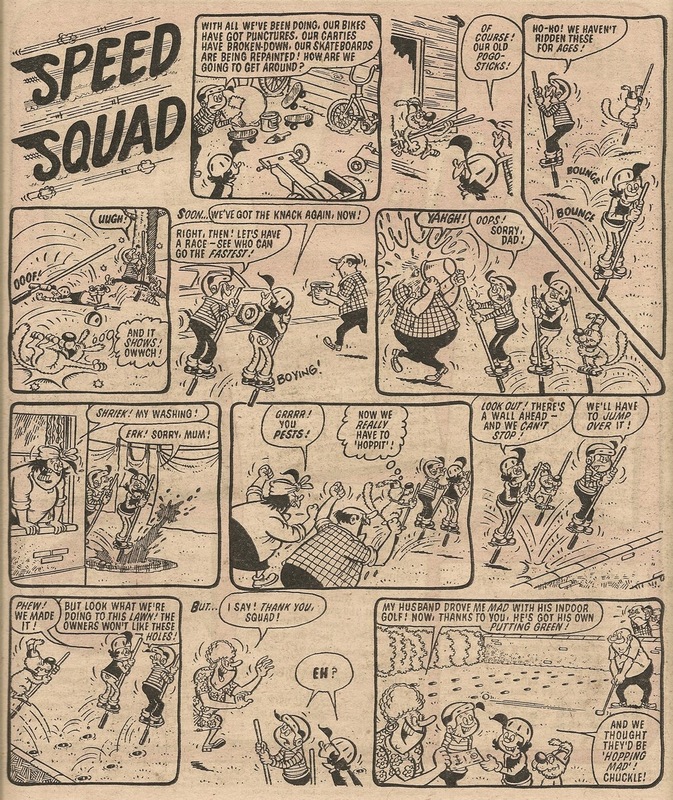 Mike Lacey did a great job on the strip but it was a shame Frank McDiarmid, who drew all the subsequent Cheeky strips in Whoopee!, wasn't available to introduce the toothy funster and his pals to those readers who weren't familiar with the characters. Maybe Frank was too busy or just wanted a well-deserved break after all his hard work on Cheeky Weekly. Barrie Appleby gets us off to a rollicking start with his Cheeky's Week...Sunday cover strip in which we witness an injury-free Bump-Bump Bernie, before Cheeky engages in minty mirth with Manhole Man (making his 16th front-page appearance). This is Barrie's second and final front cover Cheeky's Week (although not his last Cheeky Weekly work). 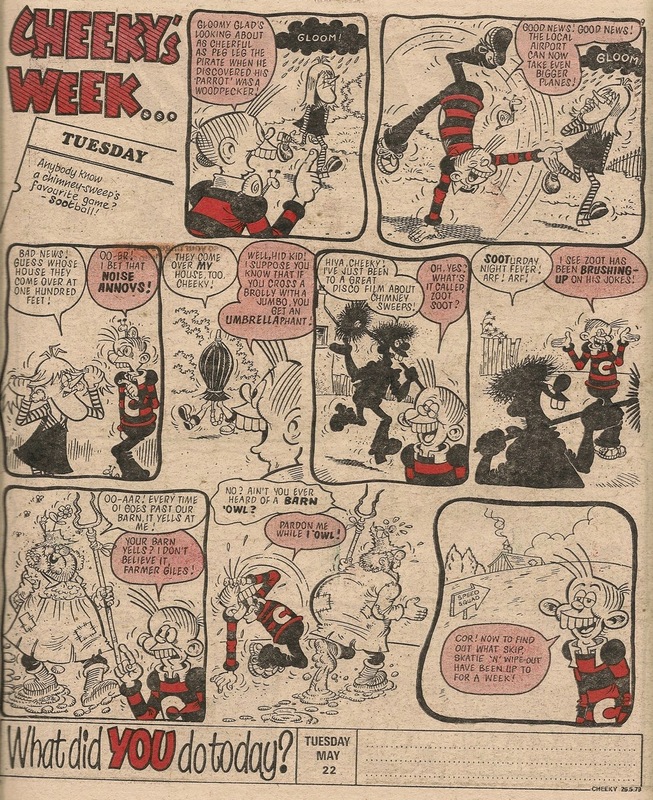 Mr Appleby hands over the Cheeky's Week artwork duties to Jimmy Hansen on page 2, and it appears Jimmy's original final panel on the Monday page has been substituted with two images by Frank McDiarmid culled from the 24 March 1979 issue. Jimmy's final frame may have introduced Calculator Kid, who is absent this week. 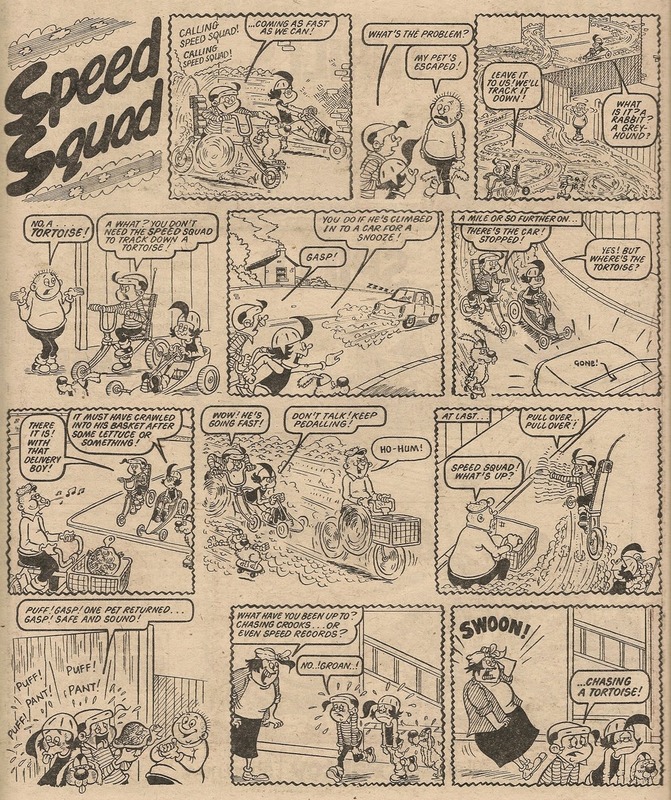 There's further final-panel adjustment on Tuesday when another Frank McDiarmid image, this time sourced from the 31 March 1979 comic, has been pasted in to introduce the return of erstwhile Skateboard Squad members Skipper, Skatie and Wipe-Out in their new guise of Speed Squad. 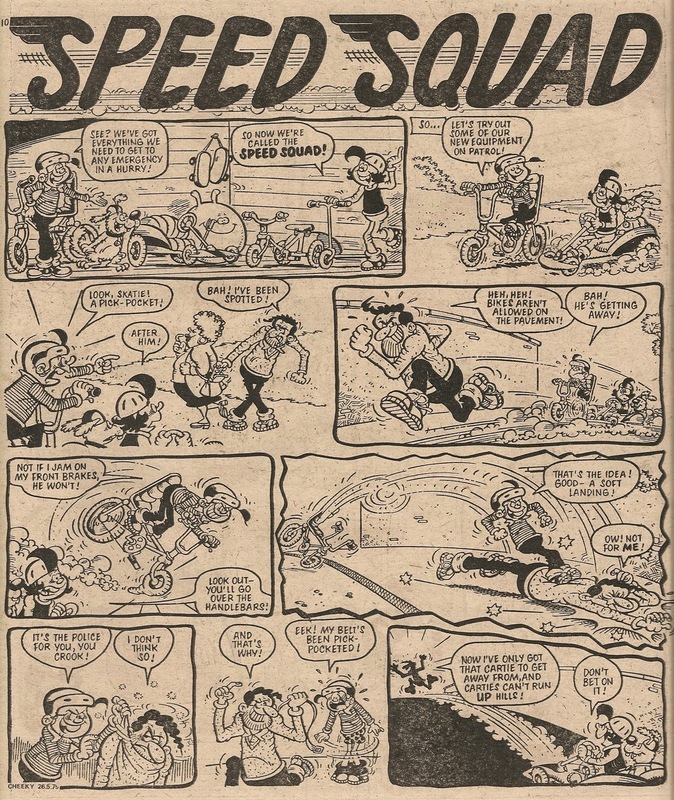 Maybe when Jimmy drew the page he wasn't aware that the issue in which it was to appear would coincide with the Squad's relaunch strip featuring the intrepid trio travelling by bike and go-cart, and drew an intro frame with the Squad on their skateboards. Cheeky doesn't reveal how he came by this week's issue of the Mystery Comic which, in contrast to last week's smutty issue, is squeaky clean. Disaster Des is absent from this week's Mystery Comic, possibly because the Star Guest strip (Happy Families from Whizzer and Chips) is located within the pages of the perplexing publication. 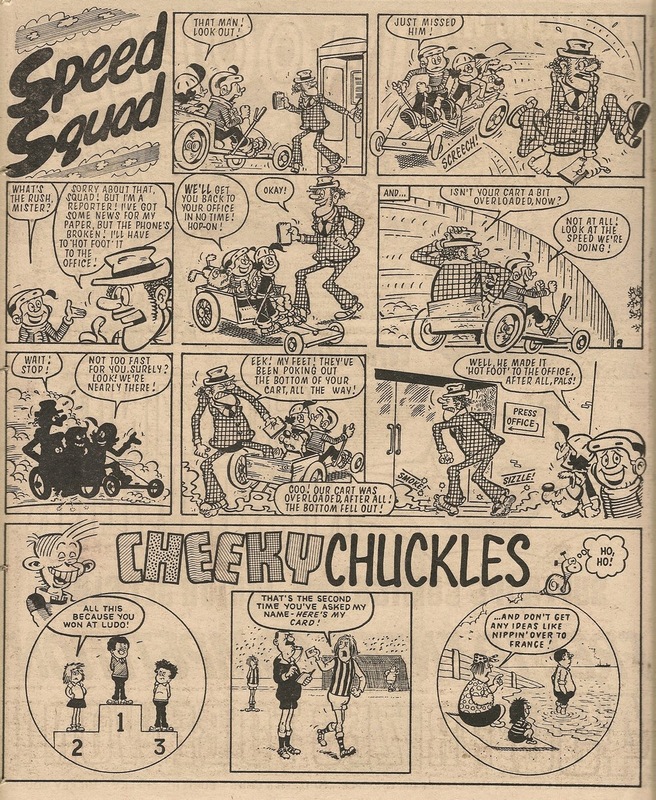 We return to the Cheeky Weekly section with two rather dull pages from the latest instalment of the Cheeky Spotter Book of Town and Around, after which Cheeky's Week resumes (with Thursday), now drawn by Frank McDiarmid pencils. However, yet again there is evidence of altered artwork in the final frame, which is by Mike Lacey. 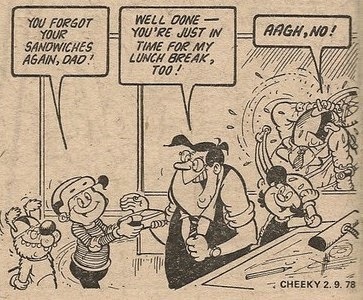 This time the pasted-in panel hasn't come from another issue of Cheeky Weekly – the shape of the frame, resembling as it does the shape of the final panel of Tuesday, suggests to me that it may be the frame which was excised from Mike's Tuesday page above. 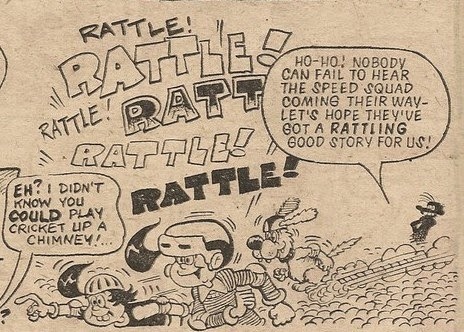 Maybe Paddywack was originally scheduled to appear on the page following Tuesday (which he did on 37 occasions) but was shunted back in the comic due to the introductory Speed Squad tale covering one and a half pages. Since neither of the pages affected have any day-specific content other than the title panels, surely (if my speculations are correct) it would have been easier to swap the first panels of Tuesday and Thursday around rather than cobbling together new end frames. After Cheeky and pals have fun in a maze on Saturday, the comic reaches its chortlesome conclusion with a Burpo Special focusing on Cheeky's cover co-star, Manhole Man. This issue we say goodbye to amusement arcade enthusiast Ding-Dong Debbie. 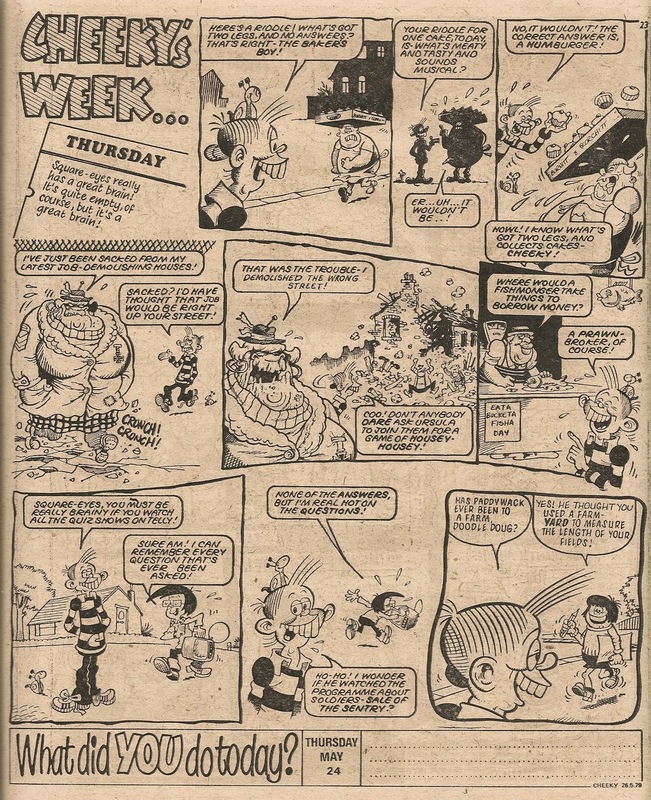 Four artists (or artist collaboration in the case of Frank McDiarmid pencils) contributed to Cheeky's Week in this edition (see second table below for the breakdown - note I have ignored the cut-and-pastery in evidence this week when compiling the artist figures). 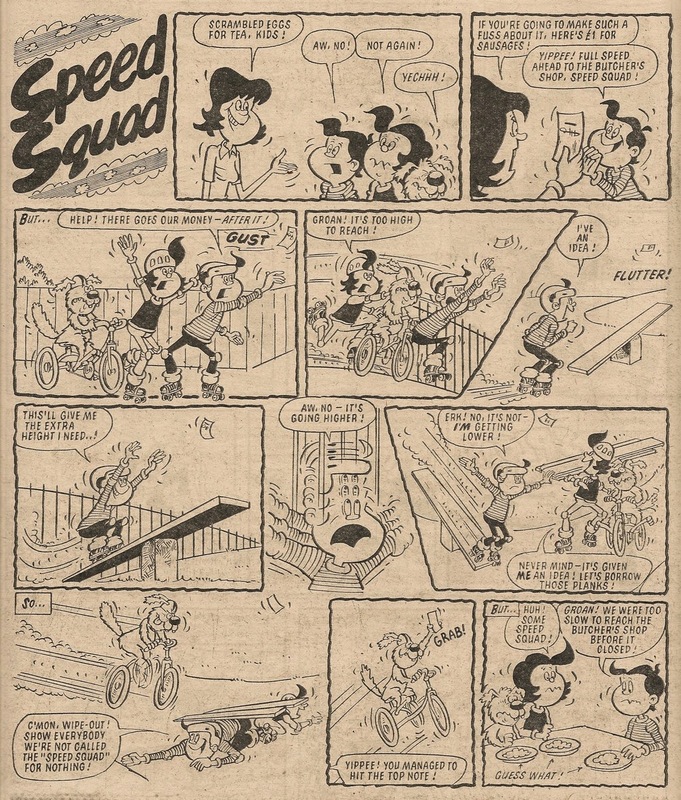 The most recent issue to include that number of contributors was the 29 April 1978 comic. 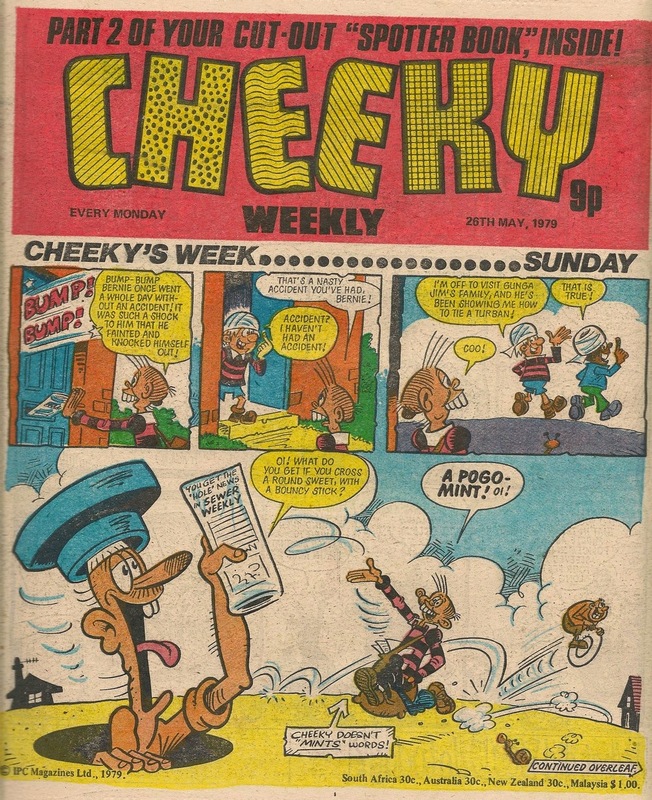 There was only one issue featuring a higher number of Cheeky's Week artists, and that was 08 April 1978.